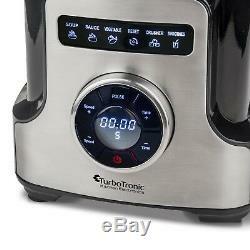 TurboTronic 2000W Professional Power Blender 10 Speeds 6 Modes LED Display TT-PB800. 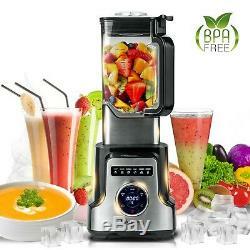 The ChopMaster Professional Power Blender TT-PB800, elegant design joins modern performance to offer a luxurious high-powered kitchen tool with 2000W full copper motor and Max 32000 RPM / Min. 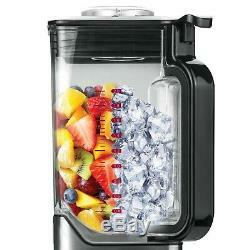 XL 2.0 Liter square shape BPA Free blender jar. Features elegant LED display For easy operation. The 6 Crushing blades that blast through ice and frozen fruit in seconds for perfect ice crushing, blending, and controlled processing. 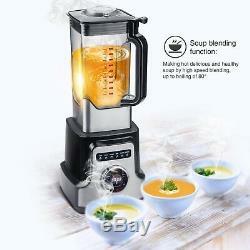 The Soup blending function: Making hot delicious and healthy soup by high speed. 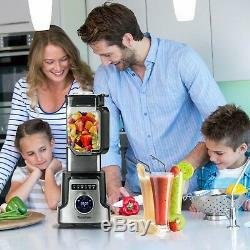 The Smoothy function: perfect for making creamy, frozen drinks and smoothies for the entire family. Powerful: 220-240V, 50/60Hz, 2000W full copper motor. High speed: Max 32000 RPM / Min. 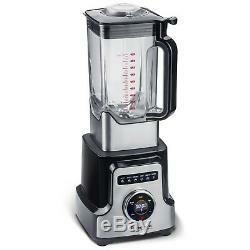 Stainless Steel Blender jar base. 2.0 Liter square shape blender jar. Intelligent Mode: 6 modes with light illuminated. 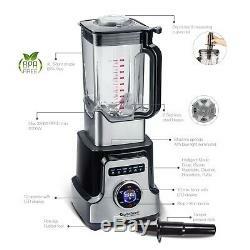 Soup, Sauce, Vegetable, Crusher, Smoothies, Pulse. 10 speeds with LED display. Big, Special and Efficient S/S blades for perfect crushing. Measure cup and Drip holes on. Soft touch Rubber jar handle. With 1 pcs Food presser stick. We have both UK and EU stocks available if required. PLEASE NOTE THAT WE WILL ONLY BE DELIVERING TO UK MAINLAND. PLEASE ALLOW 24 HOURS TO GET A REPLY FROM US. The item "TurboTronic 2000W Professional High Speed Heavy Duty Electric Food Blender Mixer" is in sale since Tuesday, January 8, 2019. 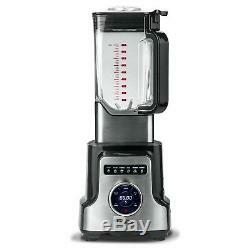 This item is in the category "Home, Furniture & DIY\Appliances\Small Kitchen Appliances\Table Top Blenders". The seller is "radionakosenkova_0" and is located in rochester. This item can be shipped to United Kingdom, Austria, Belgium, Bulgaria, Croatia, Cyprus, Czech republic, Denmark, Estonia, Finland, France, Germany, Greece, Hungary, Ireland, Italy, Latvia, Lithuania, Luxembourg, Malta, Netherlands, Poland, Portugal, Romania, Slovakia, Slovenia, Spain, Sweden, Australia, United States, Canada, Brazil, Japan, New Zealand, China, Israel, Hong Kong, Norway, Indonesia, Malaysia, Mexico, Singapore, South Korea, Switzerland, Taiwan, Thailand, Saudi arabia, South africa, United arab emirates, Ukraine, Chile, Antigua and barbuda, Bangladesh, Belize, Bermuda, Bolivia, Barbados, Brunei darussalam, Cayman islands, Dominica, Ecuador, Egypt, Guernsey, Gibraltar, Guadeloupe, Grenada, French guiana, Iceland, Jersey, Jordan, Cambodia, Saint kitts and nevis, Saint lucia, Liechtenstein, Sri lanka, Macao, Monaco, Maldives, Montserrat, Martinique, Nicaragua, Oman, Pakistan, Peru, Paraguay, Reunion, Turks and caicos islands, Aruba.